Lyon continues her role to accompany the Prince everywhere as his bodyguard. Whether it's recruiting Raftfleet's aid, delving into the Sindar Ruins of Ceras Lake, or running into the flames of an attacked Beaver Lodge, Lyon is never found far from the Prince's side. Lyon accompanies the Prince to meet Sialeeds at the Sol-Falena dam. Although Lyon protests, she fights Sialeeds in battle, and beats her. After the Prince and Sialeeds seal the power of the Sun Rune with their runes, Sialeeds collaspes and the rune selects Lyon as a host. Lyon carries the rune alongside the Prince and uses it to open the secret passage in Lunas, and again in the Sindar Ruins in the Ashtwal Mountains. However, the Sun Rune's light changes from a destructive power to a nuturing one, and restores Lyon's body. The power of the Dawn and Twilight Runes, combined with the power of the Stars of Destiny, are what caused this change. After she recovers, Lyon removes the Twilight Rune from her hand and places it back on it's statue, which is moved back to the Sun Palace. 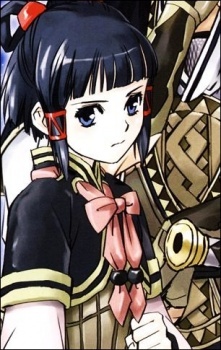 Lyon returns to her normal duties after the war, and always stands by the Prince's side.